With the end of the Yom Kippur War and the European Community’s first common statement on a matter of foreign policy in 1973, the European Community became confident enough to move towards a political democratic union. Soon the second representation of European citizenship, ‘A People’s Europe’, emerged. 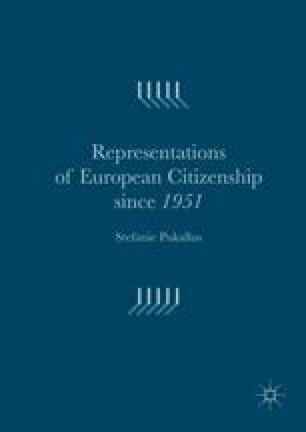 It was a form of political-federal European citizenship which ascribed special political rights such as voting rights to the European citizen. It was also during this time that the European Community turned to the use of political-federal symbols similar to those of a nation-state that marked the European ‘homeland’ and introduced specifically European cultural events. CCE (Commission des Communautés Européennes). (2008). Television broadcasting activities: “Television without frontiers” (TVWF) directive. http://europa.eu/legislation_summaries/audiovisual_and_media/l24101_en.htm. Accessed 17 Jan 2012. CCE (Commission des Communautés Européennes). (2012a). Education and training. http://ec.europa.eu/education/index_en.htm. Accessed 13 Jan 2012. CCE (Commission des Communautés Européennes). (2012b). Culture ‘European capital of culture’. http://ec.europa.eu/culture/our-programmes-and-actions/doc413_en.htm. Accessed 12 Jan 2012. CCE (Commission des Communautés Européennes). (2012c). Europa—Public opinion analysis—Standard Eurobarometer archives. http://ec.europa.eu/public_opinion/archives/eb_arch_en.htm. Accessed 5 Dec 2011. CVCE. (2012a). European Political Cooperation. http://www.cvce.eu/obj/European_Political_Cooperation-en-23ec8fd2-1ae6-4133-91a5-4788e2e184bf.html. Accessed 21 Jan 2012. CVCE. (2012b). How European Political Cooperation worked in practice. http://www.cvce.eu/obj/How_European_Political_Cooperation_worked_in_practice-en-9fb43023-e923-4e92-b007-68a229758897.html. Accessed 21 Jan 2012. CVCE. (2012c). Joint statement by the governments of the EEC (6 November 1973). http://www.cvce.eu/obj/Joint_statement_by_the_Governments_of_the_EEC_6_November_1973-en-a08b36bc-6d29-475c-aadb-0f71c59dbc3e.html. Accessed 5 Jan 2012. CVCE. (2012d). Final communiqué of the Paris Summit (9 and 10 December 1974). http://www.cvce.eu/obj/Final_communique_of_the_Paris_Summit_9_and_10_December_1974-en-2acd8532-b271-49ed-bf63-bd8131180d6b.html. Accessed 7 Jan 2012. Dulphy, A., & Manigand, C. (2008). Entretien avec Jacques-René Rabier. Propos recueillis le 16 décembre 2008. Histoire@Politique, no 07 janvier – avril 2009. http://www.histoire-politique.fr/index.php?numero=07&rub=portraits&item=10. Accessed 29 Jan 2012. Dulphy, A., & Manigand, C. (2010). Entretien avec Paul Collowald. Propos recueillis à Bruxelles le 3 juillet 2010. Histoire@Politique, no 13 janvier – avril 2011. http://www.histoire-politique.fr/index.php?numero=13&rub=portraits&item=18. Accessed 29 Jan 2012. EP. (2012). European years. http://www.europarl.org.uk/view/en/Events/special_events/European-Years.html;jsessionid=95963BA30997630C86EB217CA2897AB0. Accessed 14 July 2012. Foret, F. (2009). Symbolic dimensions of EU legitimization. Media Culture Society, 31(2). http://www.sciencespo.site.ulb.ac.be/dossiers_membres/foret-francois/fichiers/foret-francois-publication29.pdf. Accessed 12 June 2012. Library of Congress. (2003). Foreign affairs in the Nixon era. http://www.loc.gov/loc/lcib/0307-8/policy.html. Accessed 22 Jan 2012. Moravcsik, A. (1994). Why the European Community strengthens the state: Domestic politics and international cooperation. Harvard University Center for European Studies, no. 52. http://www.ces.fas.harvard.edu/publications/docs/pdfs/Moravcsik52.pdf. Accessed 12 Mar 2010. Moravcsik, A. (2005a). Europe without illusions: A category mistake. Prospect, Issue 112, July. http://www.prospect-magazine.co.uk/article_details.php?id=6939. Accessed 12 Mar 2010.